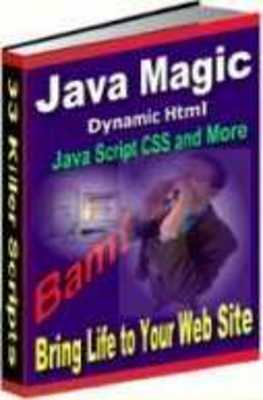 Re: NEW Website Magic With Easy Paste-In Java Scripts! Have you ever tried to follow a programmers simple instructions? Its like they talk a different language than the rest of us. Dont get me wrong. I LOVE all the cool stuff they come up with. But why cant they explain how to use their latest inventions so the normal person can understand? Now picture this. Imagine yourself using the latest breakthroughs to make your web pages come alive without hours of frustration trying to get the techniques to work right. Push-button success. Without confusion. Without hassles. Stop Them In Their Tracks...Or Else! The web is a graphic medium. Besides offering compelling content, you must display it in a visually appealing manner. Or else... CLICK goes your visitor. Heres the bad news. Up until now these innovative techniques have been strictly reserved for the $150 an hour web designers and programmers. This new book blasts open the doors to their secrets. Youll be electrified as you bring a whole new dimension to your web site. Within minutes your web pages will stand light-years ahead of your competition. If you can copy and paste, this book will set your imagination on fire. Listen. Im not a techie geek. Im just a webmaster without ANY programming certification. I simply needed a one-up on my competitiors. What about you? Whats more, spending a couple grand for a professional web designer just wasnt in the cards for me. Months ago, I didnt have a clue I would spend hours upon hours, days upon days learning how to use, control and manipulate the scripts, codes and dynamic effects I packed into this book. But up until now there wasnt a whole lot of choices for creating one of those sites that make you go... WOW! Either you could spend $1,500 for a professional web designer (or more!) or you HAD to spend maddening hours and hours working, manipulating, and perfecting the devices. Thats history. Just minutes from now youll create pages that will knock your socks off. And youll use these innovations with point and click accuracy that will save you from migraines the size of Mt. Everest! As you rip into the meat of the book youll quickly become hooked on the endless possibilities. No kidding. Youll probably lose sleep letting your imagination explore the trade secrets that make it a blast making web pages. Simply put, youll be glued to your computer. Because these effects are presented in everyday normal persons english, youll see through the dark tunnel of the programming nightmare. Youll find all the nonsense techie talk stripped away so what youre left with is clear foolproof instructions, easy copy and paste codes, and inspiring turnkey examples that will make your heart race. No trial and error. No headaches. No taking a sledgehammer to your computer. WARNING: If youre a computer geek (i.e. programmer) this book is definitely NOT for you. This book is for NORMAL folks in cyberspace that want to add a touch of brilliance to their pages and skip all that HTML techie talk. So is that you? Do you want to jump right past all those HTML tutorials and right into the meat of using advanced web page design techniques? Everything You Need To Get The WOW! No more searching. No long hours trying to understand all the techie gobbly-gook nonsense that keeps everyday people from using these awesome effects. Just simple copy and paste. Point and click POWER! Decide what you like and then paste it right into your web page. Nothing could be more simple. Again I warn you... if you are a programmer this book is NOT for you. And want an easy way to get dramatic web pages. Fast...but powerful pages that capture the attention of a visitor. If thats you then heres the deal. Buy this book. Its dirt-cheap. About the cost of a pizza. When I consider how long it took me to unravel all the techie language its an incredible basement bargain. If you wanted to hire a designer to install just a couple of the effects youll magically create minutes from now, you would pay a minimum of $250. You might even pay a cool thousand if you add in the specifically written tutorials and the paint-by-numbers instruction. Put me to the test. Try out the scripts and the codes. Youll see the results immediately. It wont take you hours...or days of trying to understand a bunch of headache-inducing techie language. Use the effects in your web pages. See if your visitor stats start to increase. As the word gets around that YOUR site is way-cool youll see the charts climbing.